Almost every child grows up with dreams. Some want to become firefighters, some want to become astronauts and others want to become baseball players. For most kids, these dreams and wishes change hundreds of times before they grow up and realize that their dreams are improbable. Not all dreams die, however. Mike Thomas and Nate Eppley were both recent selections in the 2011 MLB draft. Eppley was drafted in the 29th round of the Major League Baseball draft by the Oakland Athletics, while Thomas was selected in the 35th round by the Los Angeles Dodgers. Thomas began his career with the AZL Dodgers, going 2-1 with a 2.49 ERA through 12 games played. 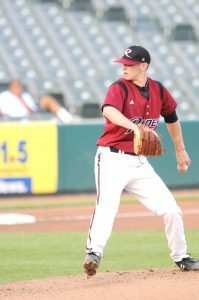 He received a promotion to the Ogden Raptors, and has gone 0-2 with a 9.26 ERA. Eppley, playing for the AZL Atheltics, has appeared in 18 games earning a 3.58 ERA. Thomas had the same mindset after finding out that he had been selected. For Thomas, the opportunity to play was a feeling he could never describe, as all of his hard work had finally accumulated into one defining moment. Both Eppley and Thomas had outstanding careers at Rider. Thomas holds the Rider record for career wins and strikeouts. 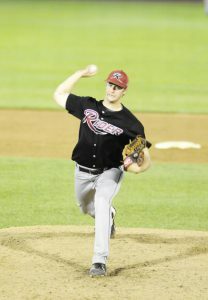 Eppley was the 2009 Rider Pitcher of the Year. Both are using the skills they gained at Rider to help bridge the gap to their professional careers. Thomas knows his time with Rider will always be with him. Mike Thomas was drafted by the Los Angeles Dodgers. Both players are now seeing their hard work at Rider pay off, especially with some of the different tricks that they have learned from their coaches. Thomas has learned his own strategies. Both men have only begun what they hope will be long and prosperous careers. They both will continue to work like they did at Rider to move up the rankings, hopefully making it to the major’s one day. Thomas thinks the same way as his former teammate.